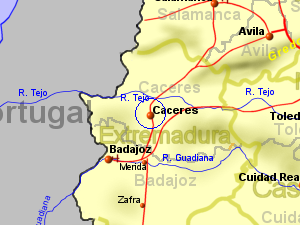 Caceres, at a height of 405m, in a relativley non mountainous area and 250Km from the sea to the south and west, but with mountains to the north east rising to 1400m. Winter temperatures are similar to those on the north coast but with summer temperatures being significantly higher, edging towards the highest in Spain, due to the continental effect of being surrounded by so much land. It is also reasonably dry with rain carried on westerly winds from the atlantic being dropped on higher ground in Portugal.